According to Defense News, the U.S. Navy’s inventory of manned intelligence, surveillance, and reconnaissance (ISR) platforms – land-based P-3 Orion and EP-3 Aries – will be cut by more than a quarter over the next few years. The current consolidations are not the first time in recent history the Navy has trimmed ISR capability. As late as the 1990s, a typical carrier air wing deployed with a number of organic platforms capable of collecting intelligence, including tactical aircraft such as the F-14 with the Tactical Airborne Reconnaissance Pod System (TARPS) and ES-3A Shadows for electronic signals intercept (ELINT). These aircraft were supplemented by a robust ground-based P-3 fleet along with numerous forward-looking infrared (FLIR)- and radar-capable helicopters on smaller cruisers and destroyers. Today’s remaining manned aircraft, such as the venerable, but still effective, P-3s are often found flying over-land missions in support of counter-terrorism and counter-insurgency operations. While the manned P-3 will eventually be replaced by Boeing’s manned P-8A Poseidon, the future of maritime ISR is unmanned. In the near-term, tactical UAVs such as ScanEagle and Firescout will increase in numbers across the surface fleet. Although their video can be transmitted over the horizon via satellite links from their launching ships, the shorter range of tactical UAVs generally makes them more appropriate for local reconnaissance operations. 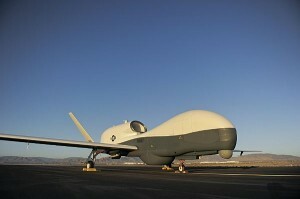 The MQ-4C Triton Broad Area Maritime Surveillance (BAMS) will soon be available to cover theater ISR missions, and eventually, as long-endurance, carrier-based drones are added to the fleet, the equation will tip even more in favor of unmanned ISR assets. Carrier-based unmanned ISR aircraft will bring unprecedented capabilities to the U.S. Navy after over nine decades of naval aviation. First, the aircraft will realize high sortie generation rates due to reduced maintenance and pilot proficiency requirements. Because these aircraft will have much longer endurance than any manned aircraft, fewer planes will be needed to provide on-station ISR, which will be for a longer duration and can cover a larger area of land and sea. RQ-4 Global Hawks (BAMS’ brothers) are already demonstrating these ultra long-range patrols in the Middle East and Western Pacific. Secondly, wear and tear on airframes will be greatly reduced compared to manned aircraft. Today when a carrier deploys, pilots must fly to remain proficient during the ship’s transit to and from an operating area. These transits can take over a month each way and the hours put on those aircraft during proficiency flights do not directly contribute to operations. The airframes of UAVs will only be flown operationally and not for training, extending their overall lifecycles. Additionally, because drones will not need to be tied to pilots in a squadron for training during transit, at least some of them could be cross-decked from a departing carrier to a new ship rotating into the operational theater (usually Central Command). Cross-decking will produce more operational sorties per aircraft than an equivalent number of manned planes, resulting in a smaller overall required UAV inventory. Finally, unmanned aviation will eventually result in higher rates of fully mission capable aircraft than their manned counterparts on deployment. When a drone on a deployed aircraft carrier breaks down to the extent it requires depot-level repairs, it can be boxed up in the hangar and another drone can self-deploy within 24 hours from the United States or Europe to the carrier’s forward location to take its place. Drawing from a pool of “just-in-time” spares without worrying about ferry pilots, refueling, and other issues associated with short-range tactical aircraft will make CVNs that much more valuable. The Navy has arrived at a critical juncture towards deciding the future of unmanned aviation. The solicitation for the Navy’s Unmanned Carrier Launched Surveillance and Strike (UCLASS) program was delayed from last fall until sometime this spring. Amy Butler at Aviation Week has discussed the Navy’s internal debates between aspects of survivability, endurance, payload capacity, and stealth. Yet, possibly the most important factor that should be considered in this program is affordability. The price points of the potential UCLASS competitors’ vehicles are publicly unknown, but the assumption might be made that generally a reduced-signature aircraft such as Northrop’s X-47B will drive higher program cost than a less stealthy platform like General Atomics’ Sea Avenger. Of course, as with any aircraft, total cost of ownership for UAVs includes training, maintenance, upgrades, and all ground-based infrastructure. In this area, the Sea Avenger also would likely save the Navy money because of the commonality of its ground control systems, communications networks, and other systems with the now-ubiquitous MQ-1 and MQ-9 aircraft flown by the Air Force and other agencies. If the Navy misfires on this program, at some point unmanned carrier aviation – or possibly carrier aviation writ large – could become unaffordable for the U.S. Navy. Wise choices up front in the UCLASS solicitation could pay big dividends decades from now. P-3C Orion isn’t an ISR aircraft primarily – it’s an anti-submarine warfare (ASW) aircraft. Same goes for the aircraft which is replacing it: the P-8A Poseidon. Yes, those aircraft are designed primarily as ASW aircraft, but for the past decade, P-3s have been primarily conducting ISR. The need for an ASW aircraft will never go away, but eventually even that mission will be performed at least in part by unmanned A/C. So, you agree with hokie_1997. The P-3, and the P-8, are ASW aircraft that also have a robust ISR capability and can perform that mission. ASW may be the last mission area that transitions to UAS – computer controled art is very difficult to do well! Yes, the operational art will always be human, but a human-controlled drone can drop a sonobouy pattern (likely more precisely) and do a radar flood just as well as a P-3 or P-8. Given six months and a few million, I bet we could have an MQ-9 dropping sonobouys and making MAD runs.